Have ever debated between wearing something fashionable or comfortable, look no further—Stacey Bafi-Yeboa has you covered! Self taught designer Stacey used to dance on Broadway until she discovered her talent as a fashion designer. As someone that loves to move, Stacey created KANIA to merge the lines between comfort and fashion. Making her debut at this year’s Toronto World MasterCard Fashion Week, KANIA gave an amazing impression when models danced down the runway. Faze caught up with Stacey before her Fashion Week debut to talk more about her beginning, inspiration and her new collection. What moved you to leave your career as a professional dancer to pursue a luxury sweatshirt line? Stacey: The transition was one that was not planned. I began making my own clothes so that I had something comfortable to wear after dance performances and class. I’d used the same fabric as workout wear but styled it more fashionably. It became popular amongst my friends and people started to ask me where they could purchase my pieces. I realized that I was filling a gap in the market place, where fitness meets fashion. This was the intro of KANIA–Luxury Sweatshirt Line. What would you say is the biggest difference between dancing on Broadway and running your own fashion line? Any similarities? Stacey: Dancing on Broadway and being a performing artist for many years has trained me for this business called” fashion”. The two worlds are very similar. They are both extremely creative, yet subjective. In both worlds you need to learn how to think quickly on your feet, stay true to yourself and hustle, hustle, hustle. To me, there aren’t many differences working in any creative field. The form of art is what’s different. However, I’d say the biggest difference is that as a dancer, my agent would send me for roles, I’d show up, audition and hope I get it. In fashion, I believe my mission to create my own destiny. You get what you put in. When you started KANIA as a self-taught designer. What were some of your challenges? Stacey: I learned [how to design] from watching my mom growing up but I never went to fashion school. I do find it challenging sometimes, but most of the time I see it as a blessing. Not being trained also allows me to not overthink things. I create what I want in the moment, freely and unrestricted. Many people in the industry find themselves in a “creative block” so what is something that you do to keep your creative juices flowing? Stacey:This is so true! I have been blocked myself. You can be blocked creatively and not even realize it. The best way for me to unblock myself is to go on artist dates. This allows me to be inspired by the world around me. Going on a long walk, writing, watching the clouds, dancing, running through the streets of New York City– these things help to keep things fresh. Also, I surround myself with positive people. Negative vibes will block you in a second. When looking at your entire collection, is there a specific piece that you feel the most attached too? Stacey: Snuggalicious for sure, she is like my baby girl! As a KANIA classic, it’s been around forever and it never goes out of style. My mission is to make practical wearable clothing and Snuggalicious is that to a tee. It accentuates all your assets, the big shawl collar/oversized hood frames your face, and the wide waist band cinches your waist. It can be worn by all sizes and all ages. 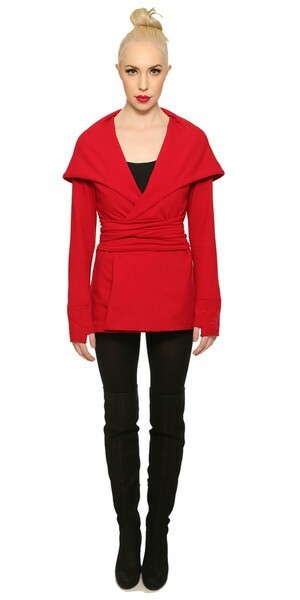 Snuggalicious is one of those pieces that every woman needs in her closet. Whether you’re running out to the grocery store or on a hot date, its perfection. This is your first time showing at Toronto World MasterCard Fashion Week, can you tell us a bit about what we can expect to see in your collection this season? Stacey: Presenting at WMCFW is a huge stepping stone. Being seen as one of Canada’s top designers is an absolute honour and I am truly excited to take this step. The inspiration for KANIA FW2015 is to keep it simple and to truly outline what our customers love about KANIA–the ability to move through life feeling comfortable and beautiful. So we’ll be introducing Canada’s Luxury Sweatshirt Line–16 sweatshirts will grace the runway on Thursday, March 26th at 4pm. For work, yoga, daycare, the mall, a hot date– these luxury sweatshirts are made to move. A portion of your sales are donated to a select charity every year, can you tell us more? Stacey:The word “KANIA” pronounced “Ka-–Knee–Ah” means “light”. The name was chosen for two reasons. First, it symbolizes inner beauty, a glow. 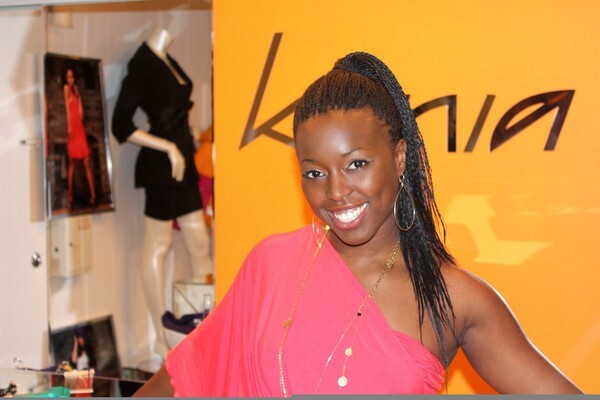 I want every woman to wear KANIA and feel radiant. Second, I want to help spread light around by giving back to charities. I always believe that in life if you give, you will receive. I also started a premium fashion and charity event called FLAUNT. It is a night to sipping cocktails, shopping independent designers, grooving to the beat of the DJ and seeing a fashion show in support of local charities. Our first FLAUNT event this year will be held on Sunday April 26 at the Endras Infiniti showroom. The three local charities that we are supporting this year are Community Innovation Lab, Driven 2 Smile and Voice for Hearing Impaired Children. Check out KANIA’s official website for more details.